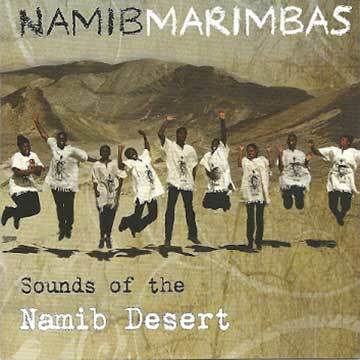 The Namib Marimbas are passionate about Namibian music. 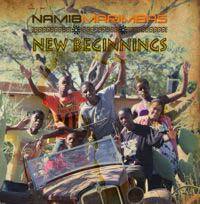 Their original compositions & musical energy mirror the friendly people of Namibia. The rhythms voice the vibrant spirit of the people. 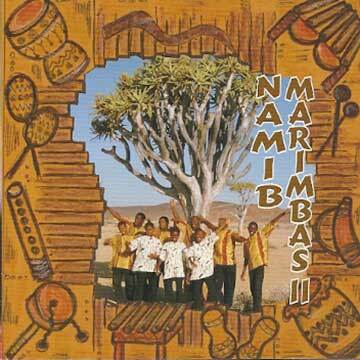 Namib Marimbas Group wishes to express their love for Namibia. Music can build bridges and they wish to deliver the message: That of respect for the culture of our ancestors and hope for a peaceful future. The exposure to the music of all cultures and nations inspires each and every group member and supports the ongoing learning process. 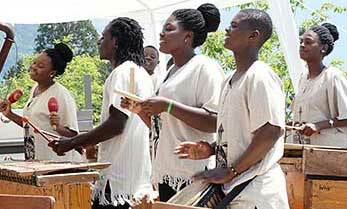 The first attempt to establish a Marimba Group in Kuisebmond could be traced back to 1987. Mrs. Denise van Bergen took the first initiative with the Mulondo and Nasima brothers. In 1988 the group took part in the SWABC Music Makers Competition and won the first prize in the instrumental category and third prize in the composition category. 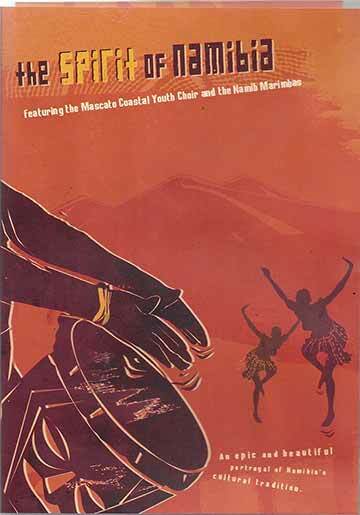 The group split up in 1989 and for many years no Marimba music was heard in Kuisebmond except during church services. 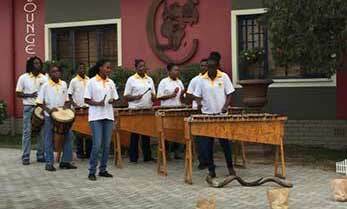 In 1992 learners Immanuel Niigambo and Josua Kapulwa founded the first Marimba Group of the Kuisebmond Secondary School. Together with fellow learners George Naubeb, Zelda Naris and Albert Nicanor they borrowed the instruments from the Anglican church and were taught by Mr. Steyn. 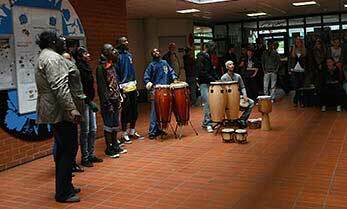 They were very successful and at the end of 1993 won the category of traditional instrumental music in Pretoria at a cultural evening organized by the Department of Education and Training: “The Binamawlo Cultural Festival”. At the end of 1993 the group dissolved, as members matriculated and moved away. 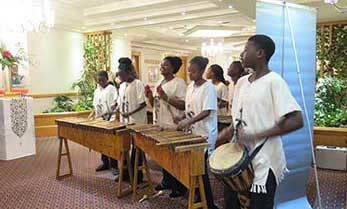 In 1995 Albert Mulondo and six fellow pupils of the Kuisebmond Secondary School, Walvis Bay, Namibia, founded the official Walvis Bay Marimba Group. Albert Mulondo unfortunately had to leave the group at the end of 1996. 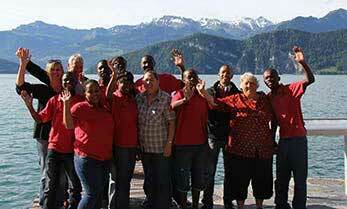 Since 1997 the group has been playing music under the guidance of their coordinator, Greta Holst, who is a teacher at the Kuisebmond Secondary School. With no formal training and their skills mainly self-taught, the group meets up daily to practice and improve their skills. As members complete their schooling they leave the group to pusue their professions, but the group lives on as new pupils join in. 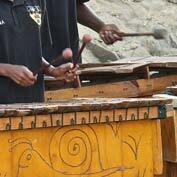 Ferdinand Hengombe, a fellow pupil, took over the musical training in 2000 and in January 2009 established the Ondjupa Art Creation & Music CC Company leading the Namib Marimbas to new successes. 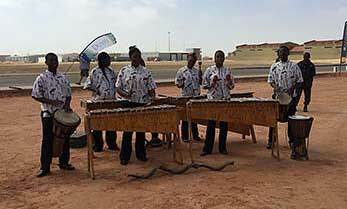 The aim was to develope percussion music at the coast of Namibia, which included Marimbas, drums, Kuduhorns & shakers. A workshop to build new Marimba instruments and repair them was further established. With his assistant Anrich Geingob, Ferdinand guided the group to perform at numerous events and venues. In 2010 when Ferdinand unfortunately had to leave the group, Mrs. Holst once again took over. 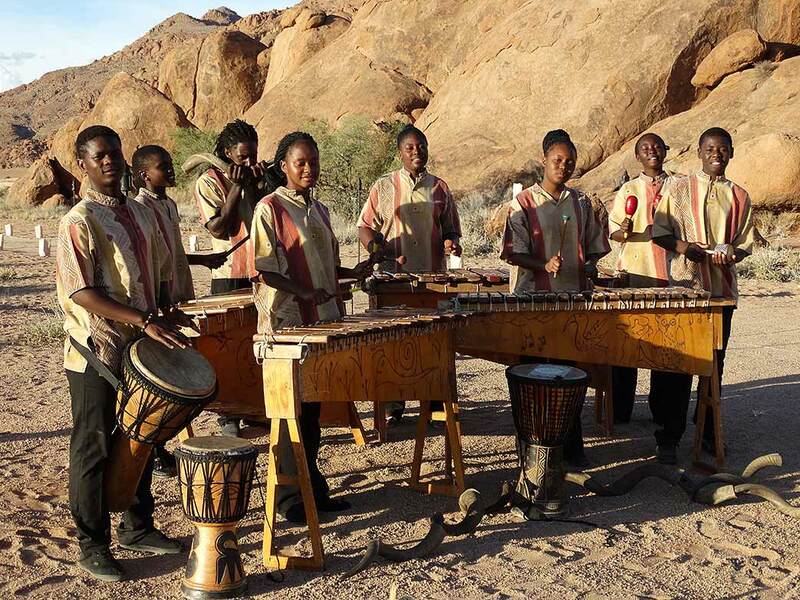 The Namib Marimbas have been growing from strength to strength producing CD's, taking part in competitions and playing at a large number of events on national and international basis. Since 2018, Gerson Dollar Mwatile took over the Group. As an old member of the Namib Marimbas and the Mascato Youth Choir, he developed a love for music. After his studies as a music teacher in drumming, singing and guitar, he started his own Music Studio – Geleff Music Studio. He also is currently the music teacher at the Alexandre Private School in Walvis Bay. Dollar is also a composer for various other artists like Yvonne Chacka Chacka Mascato Youth Choir, Namib Marimbas and Afroshine Band. Most of the songs are composed by the group members themselves. 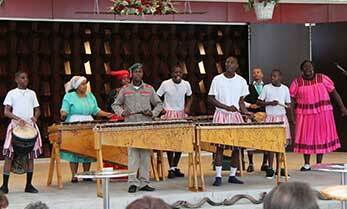 Kudu horns, pipes, drums, five Marimba instruments and various shakers were played in the production. Recorded by David Benade. You will enjoy a whole new African experience which is embedded in every melody and rhythm that emerges with many of their own compositions. 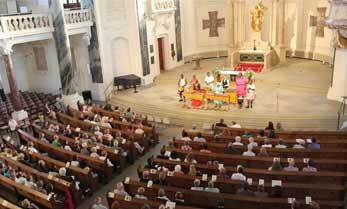 The group made use of five Marimba instruments, Kudu horns, drums, pipes and various shakers. Namib Marimbas & Mascato Coastal Youth Choir - In The Spirit of Namibia the Mascato Coastal Youth Choir and the Namib Marimba Band is introduced to the world against the backdrop of the spectecular Namibian landscape as well as cultural heritage of the country, including the traditional San people,or Bushmane, the fire-eaters from the Caprivi, the Drumbeaters from the north, the Name dancers from the south and many more. 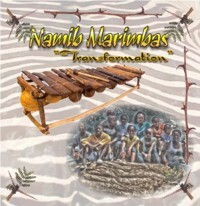 Ferdinand Hengombe, musical leader and composer of all the songs on the third CD of the Namib Marimbas, has created this unique sound to illustratethat music can build bridges. The laid-back attitude of Namibians, the environment as well as the influence of his ancestors have inspired Ferdinand to combine different genres of music and express his love for the country and the people of Namibia. The music, mainly self-composed by our musical mentor, Ferdinand Hengombe, is a unique sound to illustrate that music can build bridges. The laid-back attitude of Namibians, the environment as well as the influence of his ancestors have inspired him to combine different genres of music and express his love for the country and his people. Recorded in Narraville by Marshall Records. 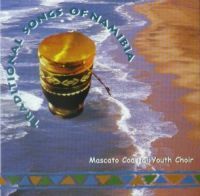 Marlene Coulson's contributions on the Namib Desert are read by Ferdinand which are accompanied by beautiful Namibian sounds. The Cd is mainly self composed by Ferdinand Hengombe with traditional music. Some very nice acapella songs to be heard. Let the bush rhythm inspire your team spirit! 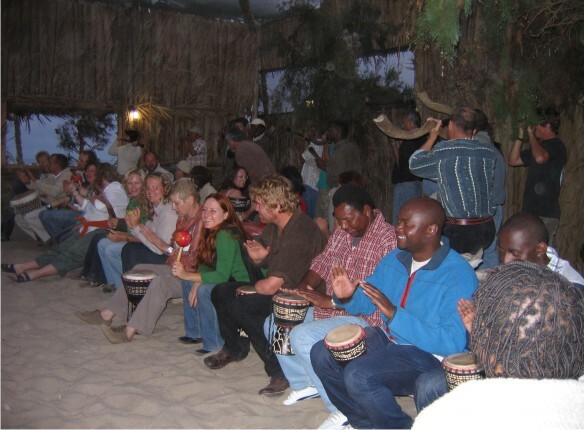 Book a teambuilding outing into the Nambian Bush. Teambuilding sessions are concluded with entertainment by traditional dancers, firespinners, the Namib Marimba Band and/or the Mascato Coastal Youth Choir. 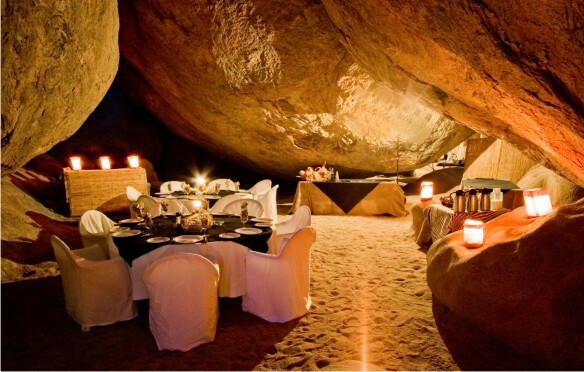 A candlelight dinner under the stars could be a worthy end to a great fun filled day. Should you want to call it a night and enjoy the silence of the African outdoors, overnight camping facilities can be arranged. It will be a memory you will cherish forever!! In the land of the brave there is a living spirit within the bush drumming rhythm which can bring different indigenous people together through interactive teambuilding drumming circles. These place great emphasis on the group spirit and work towards the goal of creating a stronger team. Candidates learn more about self-respect, habits of listening before acting, humble patience towards one another and to work as a team while learning the bush rhythm. We provide each candidate in the circle with an instrument: Djembe drum, Oryx horn, shaker, time stick or blow pipe. Instantly we introduce the bush rhythm to the candidates and teach the team in sections to simplify the learning process. Our circles cater for workshops, brainstorming and teambuilding sessions of between 10 to 150 group members. 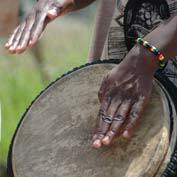 Individual or team drumming lessons can also be tailor-made to your needs, e.g. teachers, school groups or children workshops. Prof. Aldo Behrens [writer/director], Rosina Bonsu [choreographer], Ena Venter [conductor Mascato Coastal Youth Choir], music by Karl Jenkins and the financial support of Bank Windhoek made this project possible. 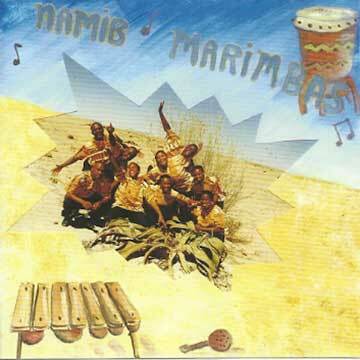 The Namib Marimbas provided all the percussion music for the musical. 15 performances in Windhoek and Swakopmund concluded in a huge success. The experience was invaluable and we are proud to have been part of it. Conducted by Linda Muller of “Education for Creative Living”. A two-week workshop was conducted under the leadership of Linda Muller. The main emphasis was the formal introduction to African Music, composing, instrument building and maintenance of instruments, recording of the music and the interaction with music students and music teachers. SAID Conference, SADC Conferences, launch of NAMFISA, Commonwealth Conference , Statehouse June 2004 – inauguration of new diamond mine, Erongo Regional Council functions, Ministry of Education, Ministry of Sport and Culture, Ministry of Health and Social Services, National Assembly, to name but a few. NAMPORT, NBC, Nedbank of Namibia, Maersk Shipping, Etale Fishing Company, Conrad Adenhauer Stiftung, to name but a few. To accumulate funds for various communities: House of Safety – Swakopmund, various church services, visits to schools, to name a few. 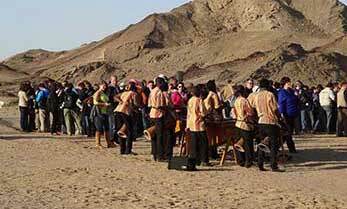 Namib Marimbas has also played music with members of the Swakopmund Youth Ochestra, combining traditional with classical music. 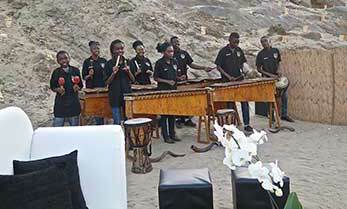 The Namib Marimbas were chosen to perform on the reality show – EXTREME AZERBAIJAN, which was filmed in Namibia. Performances took place during activities. 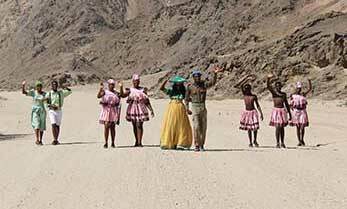 The group performs at various venues in and around Walvis Bay, Swakopmund and Windhoek including Lodges and Wild Life Resorts around the country. 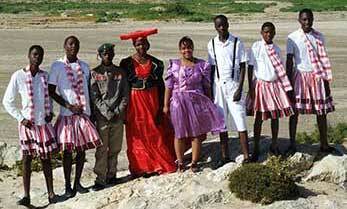 The main emphasis is to entertain tourists and to introduce Namibian culture to the visitors.